Mobile apps are a hot commodity. They’re the latest craze sweeping the digital landscape. As smartphone & tablet penetration continues to increase , it is inevitable that users are turning to mobile apps to manage important stuff like appointments, shopping, expenses, dining, travel and more. So if your business is looking at joining the bandwagon and offering a mobile app to your customers, how do you make sure that your app does not get ignored in a market teeming with mobile apps? Even if you produce a unique & awesome app, it’s not enough just to let it sit silently on the app store & then expect people to download it. Remember, there are more than a million apps in the market today and this figure is rapidly growing. Having an awesome app means nothing if your app is lost in sea of apps. Even if you have a specially selected group of people whom you built the app for, they need to be aware of its existence. That’s why, you also need to embark on a well-planned & effective marketing campaign that will put the spotlight on your app and help spread the word about it. So how do you go about promoting your mobile application? We recommend a strategic, across-the-board and well-rounded campaign that includes pre & post launch activities using organic & paid marketing platforms. to have your app help rake in profits. 1. Come up with a unique & memorable app – If your app is the first in its category, then good for you. But if this is not the case, then see to it that you integrate something unique into your app or make your app do things better than the competition. Otherwise, it would be like offering something like a “me to”. It should be useful and/or entertaining, user-friendly and relevant to your business. Also, choose an original name for your app that is memorable but one that users will understand at a glance. Your icon should also be catchy and attractive as this is the initial contact users will have with your app. And don’t forget to take exciting and informative screenshots that will capture attention, show how your app works and how user-friendly it is. 2. Use the right keywords – Identifying strong and relevant keywords for your mobile app will significantly contribute to the success of your entire marketing campaign. These are the words that will help users determine what your app is for. These are the words that people use to search for your app, whether it’s within the App Store or in Google. The process of identifying the right keywords is called App Optimisation (ASO) . Fortunately there are keyword tools available that allow you to check out your competitor’s keywords & determine how often your keywords are being used as search terms in the application stores. You can use the Google Keyword Tool or the App Store Optimisation Tool or even trial AppCod.es to pick the right keywords. Once you pick the keywords, you need to optimize the name and keywords of your app. 3. Get to know the competition – Depending on your app type, there could either be a handful or a bucketful of competitors that offer apps just like yours. Do your homework so you can determine the following: the apps on top of the search results using your keywords, other keywords they’re targeting, if their target audience is local, nation-wide or international. Then, choose the top five highest rated competitors and pay attention. You want your app to be in those positions. 4. Identify the best category for your app – You may get confused between “medical” and “health” or “reference” and “education” or “social” and “lifestyle”. So make sure to study the most relevant categories first and look at the types of apps in there before you make a decision. Get featured in review sites by reaching out to authors and pitching your app to them. Use social media (Facebook, Twitter, Path, Google+, email, Pinterest, etc.) to promote your app via word of mouth. Additionally, this will allow users to easily share your app. Easy sharing methods can motivate users to share more. Encourage users to give reviews and ratings. The better the reviews and the higher the ratings are, the better the ranking of your app. Make sure you reduce the likelihood of negative reviews by letting unhappy users contact you directly. You can do this by including contact details at the end of the app description and put a link to an “App” page on your site which also contains your contact information. Have an awesome website and landing page because at the end of the day your website still matters very much. Register for an analytics application such as App Annie and MobileDevHQ to help you track your app as well as that of your competitors. 6. Invest in paid advertising – PPC advertising, such as Google AdWords, Facebook Ads and LinkedIn Advertising, if managed effectively, can lead your target audience to your app download page. Google AdWords allows you to extend your regular Google AdWords ad with an extension to help you market your mobile app. With this extension, users can download your app straight from your Google Ad. Users can be directed to different page depending on whether they already have your app or if they don’t. You can also set up Google AdWords to target users by specific interests and advertise your mobile app within other relevant apps. What’s great about this is that you are advertising to people who are interested in a topic and who are already using mobile apps. If your target audience is on Facebook, you can also advertise on Facebook to help drive installs to mobile apps. However, in order to do this you need to place your app on the Facebook App Centre. Once your app is placed on the centre, you can then navigate to the app page and click “promote” to start the process of promoting your app. Like Google Adwords, Facebook app advertising works by directing a user to the App Store or Google Play to download an app if they click on an ad and don’t have the app already. 7. Advertise your app in advance – Tap into where your target market usually hangs out, such as forums, blogs, Facebook, Twitter, etc and let them know that an app is coming. Whether you use paid or organic advertising, this initiative will enable you to get feedback & suggestions, build a database of potential users and collect contact information. 8. Run promos and contests on your website – Create a special landing page that is an extension of your app & from there, create hype. Place links and banners on your main page to announce your app. You can also give out promo codes on Facebook & Twitter and come up with relevant raffles and contests. Have a webinar to show how your app works during the launch or you can distribute a few giveaways to the first few downloaders. The possibilities are endless when you think outside the box. 9. Create compelling messages – Identify the strongest features of your app and always come up with an awesome copy – whether for Twitter, your app’s landing page or in describing what your app is all about. Imagine yourself as your target audience and ask yourself why you should use the app. And don’t forget to have a brilliant and unforgettable tagline that describes what your app is all about. 10. Don’t forget offline – if you have a retail front or shop that gets a lot of foot traffic consider promoting using signage and point of sale to promote your app. You can have brochures or signs on counters, freestanding stands, and even stickers on any of your promotional material. 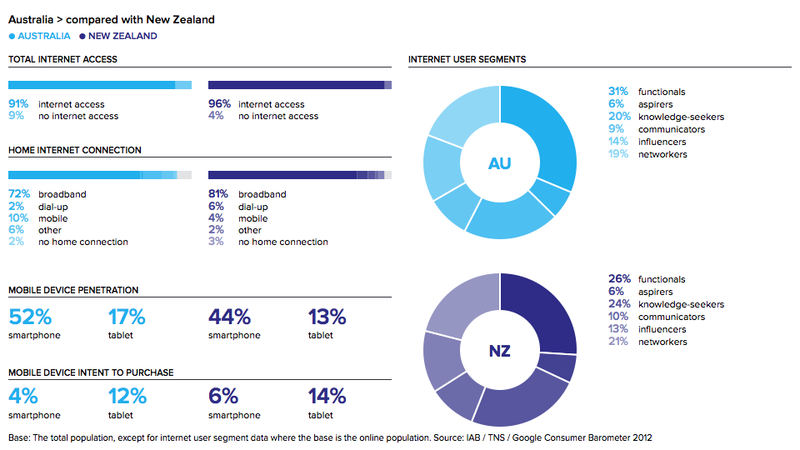 One of the big trends predicted in 2012 was that Mobile Internet will be big. So is mobile internet there yet? With over 52% of Australians owning smart phones and over 94% researching products and services on mobile devices, that’s a statistic most businesses can’t afford to ignore. The numbers are only going to get higher. Below are some interesting mobile marketing trends and what they mean for your business. Smartphone penetration: According to Google’s Our Mobile Planet, smartphone penetration in Australia is now at 52%, however a report by Telsyte predicts that nearly 90% of Australian mobile phone users will have a smartphone as their primary mobile device in 2015. That’s now less than 3 years away. Smartphone Usage: Nearly 60% of smartphone users access the Internet everyday on their smart phone and 74% don’t leave home without it. A massive 94% of smart hone users have researched a product or service on their phone and only 59% only look at the first page of results when searching on their smartphones. Interestingly, the three most popular places where people use their smart phones is at home (98%), On the go (85%) and while at work (73%). Smartphones are used while doing other activities like watching tv, using Internet, listening to music, watching films and even playing games. With such damning statistics, there is no question that smart phones are becoming important in peoples lives. In fact, 23% would rather give up tv than not have their smart phone. Mobile internet usage is quite high with 51% searching on their smart phones every day and it is projected that mobile internet use will have far surpassed desktop internet access (Morgan Stanley). Mobile Commerce: Jupiter Research estimates mobile transaction volume will grow to $670 billion by 2015. Businesses need to make mobile a central part of their strategy in order to connect to the now constantly connected consumer. Having a website that is responsive to mobile devices and that is optimised for mobile is critical – particularly as smartphone penetration & mobile internet usage increase. Your mobile optimised website should also include clickable phone numbers to make it easy for customers to connect with you. Extending advertising to include mobile and developing integrated campaigns with other media will help you engage with the constantly connected consumer. Mobile ads can and should be a part of your integrated strategy as they are a quick way to get a 1st place listing and get noticed by your potential customers. Fortunately, Google Adwords makes it relatively easy to advertise on mobile devices. 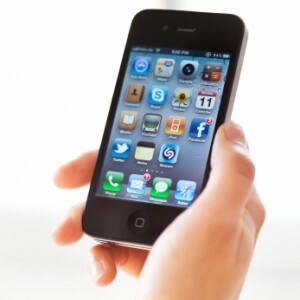 Mobile commerce is coming and while many people are still reluctant to buy with a mobile device, it will be important. Not so long ago, people were reluctant to buy online but if you think about how often you buy things on line (ebay, amazon, e-commerce stores) it’s definitely time for a rethink. At a recent networking event with the Glen Eira City Council, a question was asked about how to create mobile apps and how much they cost. As I have a friend who creates and markets apps for a living I said the cost was about $99. But the answer really is more complex than that and so is the cost. What does an App Cost? The cost of developing an app really depends on what functionality you want the app to have. For example, if you want an app developed as a vehicle to highlight specials and promotions then that is a totally different ball game. For a start, iTunes do not accept marketing related apps for the iPhone – according to my friend who creates mobile apps for iTunes, Apple have become very picky lately in accepting apps into iTunes. This means that if you want an app developed for this purpose, you will either need to promote it on your website or have an app for the android phone developed. Don’t expect that iTunes will include it in their directory unless you have developed an App that provides valuable information e.g. family friendly recipes, live footy scores , running programs etc. You will also need to specify that you want the app to have the ability to do “push notifications” (this means sending notifications to the user). Having this type of functionality will also cost a lot more to develop than the $99 I quoted earlier. Do they use iPhones or Android phones? Do you want an app for an iphone, for android or for both. Is it something you would value or download yourself? If not, how will you provide value? Does this fit with your business strategy and goals? Are there other tools out there that can do a better job? What is the problem you want the app to solve? Is there a better solution? Check out your competitors and see what they are doing. Is there something that they offer that you think could be improved upon? Can you develop something that adds even more value? Maybe your competitor is not on iTunes? It might be an overlooked opportunity, but sometimes this is not the case. It might just be because it is not financially viable. Why not go to iTunes and see what are the top downloaded apps in similar categories to you. What are the most popular apps? Is there something you can learn from the success of those apps that you can use to develop your own application. If not, I would exercise some caution. Sometimes after going down this path you might decide against having a mobile app created. You may even find you get more traction by having a version of your website that is optimised for mobile search. You could also use your Google Places listing to include coupons or promote your business. Sometimes, the answer is not always obvious. However, if you have decided to get one created you can go to AppsGeyser for Android phones or AppMakr for iPhones to have it developed. You could also commission a mobile application developer that makes apps for both iPhones & Android such as Appswiz. Otherwise you could outsource this to a programmer / developer. Be warned, if you do this yourself you will need to write up a brief that specifies everything you want, how you want it to function and ensure proper user acceptance testing agreements are in place before you sign the contract to have your app developed. You can check out this post on Mashable about Mobile apps which was published about the same time I was writing this post. If after reading this, you are unsure whether to proceed with exploring mobile apps but know you need help marketing your business then feel free to contact us.